For the last two weeks, the Lord has had me reading and He has been speaking into my life the entire 139th Psalm. But today, He told me to go inside and write. Being obedient, I did what He commanded. You can read the entire Psalm 139 for yourself, but verses 23-24 go with the main theme of what He spoke to me. The word God gave me is recorded below. With any word given through me, take it to the Lord for yourself to see if it is from God. “Many are not ready for what I will soon do in this land. There will be an event where many lives will be lost. They are not ready. They think they are ready, but there are not ready. I am a Holy God, and I require Holiness. Did you think America’s wickedness would not be exposed to the World? I expose all sin. There is not a sin a man can commit that I do not see and know about. If a man tries to hide sin in his heart, I see it and I will expose it. No man can say I did not give them the opportunity to repent from their sin. Even while you are contemplating sin, I know it. Many people think they are saved, but they are not because they refuse to repent [turn away] from their sin. I, the Lord, see everything. I know your heart, and true intentions. I know your coming and I know your going. I know every word spoken out loud, and in your heart. What is this lie you say, ‘It is just a little sin?’ If you sin and do not repent and you die in your sins, you will surely be found in hell. When this sudden event comes and many die, people who thought they were saved will be found in everlasting torment, where there is no ending. Events and judgments are coming upon this land, with greater magnitude. 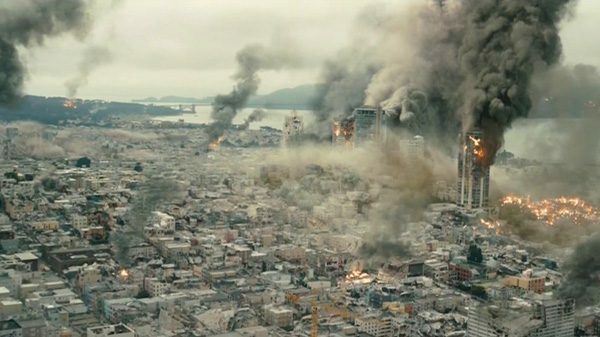 The next major event will involve the destruction of a city. From there on, I will allow whole cities, and parts of cities to be taken out in the wrath of my judgment. Thus says the Lord, “As surely as I live, no military, no president, or human can save you. My son Jesus is the savior for the whole world. For you say, it’s not coming, but the Lord says it shall surely come, and you will get a double portion of My wrath for mocking My prophets and watchmen. God says, “Come back to Me and repent daily. I required the pastors to teach holiness, and many have been slacking and not doing what I have commanded them. Thus I, the Lord, will blot them out of the Lambs Book of Life. But, to all the pastors who have taught Holiness, I, The Lord, will remember them, and great is their reward. It is important to understand, God didn’t tell me when the event would be or how the city would be destroyed. It could be from an earthquake, dirty bomb, or a day of Jihad in which the city is burned to the ground. Also, when God said, “the next major event,” please keep in mind He is determining this as major, not me. Events like what happened in San Bernardino CA or the Pulse night club in Orlando FL will not compare to this event. I understood the magnitude of this event as He was speaking to me. I encourage everyone to give your life to Jesus today. Tomorrow isn’t promised to anyone. Matt your word lines up perfectly with my last one https://z3news.com/w/relent-destruction-coming-america/ He told me it would be 10 times worse than anything that we have seen before, which Initially thought was 911 so it would mean approxamtely 35000 dead, horrible . But while reading your message, which I think is absolutely from the Lord, I heard the question “Is 911 the biggest event you have ever seen?” Immediately my mind was focused on the Christmas day Tsunami of 2004, 250000 dead, 10 times that event would be 2.5 million people losing their lives…I have a really urgent feeling that these are the kind of numbers that we may be looking at. People TODAY is the day of salvation, You are not guaranteed tomorrow on this earth. Are you right with Jesus if your soul is required of you today? There is coming a day of horrors on America, the lost city. Time and again I have warned that this day is coming, and few have heeded the call to repent and turn from their wicked ways. No one knows all but Me. Indeed, the rich get richer and the poor get poorer, but soon riches will not save and those that are last will be first. In the day of judgment only the righteous will stand and remain true to the Word and the Lord. Signals have been given, visions have been given, words of wisdom and knowledge to warn and prepare. God have mercy on the lost city. To Matt and Jeff: Thank God to you both. We as Christians, the Body of Christ, collectively and individually, have to repent of our sins continually and acknowledge that we as a nation are sinners and wicked in His eyesisght. We won’t be able to escape His judgment fully, but He will give us a hiding place physical and spiritually in Jesus. Thank you Michael may we all be counted worthy to escape all these things and stand before God. But if we must suffer Jesus is our sustainer. You are absolutely right, Jeff. I ask you, Jeff, to pray for me to repent everyday of my life, to get in right standing and relationship with Jesus, and to get discernment, dreams, visions, to be an asset to God’s people. I know I’m not ready to meet the coming judgments, much less to meet Jesus. But I wanna be ready and prepared for whatever befallen this world, our country, and our fellow believers (your and my brothers and sisters). Michael, you must understand that none of us can do it in our own strength. Just surrender to Him and He gives you more strength than you can ever imagine, its called being filled and baptised in the Holy Spirit. Thank you for that confirmation brother Matt God Bless You! I wonder if this is the earthquake/tsunami that is being talked about as soon as Obama signs that 2 state resolution to separate Palestine from Israel for God does say “you divide my land, I will divide yours”. And that event would cause millions upon millions to die so maybe this is the one. that resolution is now being discussed so when they will do this remains to be seen but i did hear that they want to resolve this before Jan.20th of 2017. Hmmmmmmmmm, google maps shows how USA will be divided also. Did you notice last that Obama said Jerusalem is not in Israel and hurricane Matthew when from a cat 1 to a cat 5 almost immediately? I do too and if you look throughout the Biblical history, anyone who touched Israel got destroyed. Obama will sign that resolution since he hates Jews and hates the ground Jesus walked on. After all, the Antichrist will never be for Israel. And now Obamanation of desolation said anyone that says he is the Antichrist he wants their names. Persecution is here now. He wants people to rat them out and unfortunately we live in a world where there are too many stupid people that will do this and they will rat them out. Yes, Jeff, I heard about what “o” said about Jerusalem not being in Israel. That is just about the craziest thing I have heard in my entire life!!! How he claims to have read the Bible & be a Christian is beyond me really. Anyone who has read the Bible knows Jerusalem belongs to Israel. That is an interesting note! WOW! I agree with have major, major disasters coming our way but are we still here by 2026? I don’t think so. I think we are gone much sooner than that. I don’t think we make it past 2020 myself. I think this is also the major event that comes to our nation soon. If the land is divided, it will be under Obama;s watch. I suspect the New madrid area will see an earthquake…but at a later date we will see the land divide that many have seen. Yes Meranda, this is correct. Obama has said that he was to make a decision on this Palestine/Israel decision before he is supposedly to leave on 1/20/2017. But he has made a comment that he believes Palestine does not belong to Israel or something to the effect so that tells us all he will definitely agree to split it in two. As soon as that is signed expect the biggest earthquake you know to happen. Divide his land, he will divide ours. We are heading into that in the near future. Millions will die as a result but does Obama care? Of course not. Even if Killary got in, she would also do it. Just like everyone is saying that they have an “assignment” now for God, well Obama’s assignment is to finish us off. He shall do it because he is fulfilling prophecy. Wow, Anna, thanks for sharing your dreams. Yes, I agree that REPENTANCE is imperative!! I’m repenting each morning and evening for all sins known and unknown and asking Jesus’ forgiveness of those. Our minds, wills, and emotions (the “soul” realm) are not “saved” but in a process of sanctification, so in essence we all sin in some way every day in thought, word, or deed. I remember reading this vision. It very well might be! Well Jeff, but how about the civil war and it’s destruction and casualties, which is the biggest and worst destruction this land and nation has ever seen through history. Yes civilwar will happen too well as nuclear bombs, earthquakes, tsunamis, disease, famine, roaming gangs etc. etc. etc. Jesus is our only hope and shelter and He is our salvation! Thanks Matt for this solemn words! Please pray for me and other Christians, who cannot quickly and surly discern the messages revealed by His Prophets, so that we can clearly discern all revelations, dreams & vision and heed His Voice swiftly each ON OUR OWN in the coming days (when the internet & z3news are down for good). Yes – I confess that I am NOT ready for the coming Matthew 24 scenarios – please pray for me & all the not-ready members of His Body to truly embrace His Death & His Cross to have Hope in the coming dark & evil hours, lest fear and unbelief will destroy many brethens. Many thanks! I have been impressed to pray that my home and property will be invisible to anyone that wishes to cause harm and that God will SEND us those He wants us to help. I have been storing water in one gallon jugs so I can assist many and that it will be easily portable. This was by instruction from the Lord. You bring out many excellent points. The fact that anyone admits they are not ready is a great sign. It shows humility and complete dependence on the Power of the Holy Spirit. Truly, that is the position that each of us is in. Spend time in the Word and quietly before the Lord to get more prepared. Greetings Ming – Be encouraged, the Lord Jesus Christ is near to those who call out to Him. I do understand, Ming! I ask for prayer for that discernment also! There is no doubt this is from Creator God! I read an article recently on Charisma which had a rebuke for doom and gloom prophets and all I could do was shake my head because the writer clearly forgot about Ezekiel, Jeremiah, Isaiah and so many others in the Bible who prophesied just like Matt is doing. Is there such a thing as a doom and gloom prophet? God doesn’t categorize His prophets and neither should we! These are not days to have itching ears! It is five minutes to midnight on the prophetic clock! That is just how close we are to the end. So God doesn’t have time to play. This is a message not just for America but for every nation and all believers. The reality is, things will not get any better but our hope rests in Jesus Christ. The message is very clear….we must all examine ourselves and repent. I hear all these better days ahead prophecies, and they never address sin, and repentance. Any true prophet or watchman will always tell a person or nation to repent, who’s not in right standing with God, so they can get in right standing with God. I also do not subscribe to the “There is no hope” theory. There are only two sins a man can’t be forgiven of, and that is blaspheming the Holy Spirit, and taking the Mark Of The Beast. You can be forgiven for all other sins in your life, and at any point before you die, because when you die there is no second chance. This applies to a nation as well, before it completely dies. It is always better for that nation to repent at the last minute, than not to repent at all. If a nation repents at the last moment, God may relent, reprieve, or mitigate his judgment or damage. The decision is up to him, but it still would better than one being to proud and not repenting at all. I can’t stand going to the “Elijah” List! ( Elijah is probably shaking his head in disbelief). It looks like one big advertisement page and honestly, I’ve never found anything there that’s relevant–at least for a very, very long time. Paula, Two of the prophesies recorded in Act, prophesy of a coming famine in Judea in Paul’s day and Paul being delivered to the gentiles (Acts 11:27-30, 21;10-14). Not exactly the most cheerful news but essential for taking appropriate action to avoid the consequences of what was prophesied. From this we can through the gift of prophesy, that God warns His people of what is to come that they may take necessary action for what lies ahead. Thanks Matt for posting this word. It confirms what the Lord shared with me this morning. This election will be like no other and He is in control not the enemy! We shall see the hand of God at work on His anointed! No matter what it seems like today and the days ahead, God’s anointed will become the next king! As the Lord said to me this morning “just watch and be astonished!” Glory to God for He is a God of power and might! And His will be done on earth as it is in heaven! Let’s all praise our God and be certain that the enemy will not prevail in this election! Thank you, Matt for this sobering message and Thank you, James for working tirelessly putting up multiple posts in a short time! This morning I feel like somebody poured out icy water over my head. Time to really get myself prepared for what is to come! Blessings! Pride is a deadly sin. Many are to proud to repent. I agree. I think, just my opinion, that it is almost impossible to fully repent without fasting and asking fervently and frequently for the Holy Spirit to give us the gift of repentance. We are so subconsciously invested in protecting our fragile egos. We need supernatural humility/grace to repent. God is faithful and will give us humility and the self awareness to repent when asked. I did a post on this log ago about regret or repentance! Most regret getting caught or they simply regret and say I am sorry but this is NOT REPENTANCE. So what is one really doing is what they need to ask themselves; regretting or truly repenting. Regret does not cause change in one’s life that is permanent. True Repentance does cause change so if no change in your life, then you did not really repent. God reads the hearts of men. Time is short. Very short now. You know when you hit repentance sincerely for you will cry like a baby and be convicted of your wrongdoings. I agree Anna about Regret not doing the job or as is the same as repentance, but I will say it could be a stepping stone. It’s very hard for me to hear when people say that they have no “regrets” when they speak about their lives-when they look back. I think a regret is the first positive step from our conscious that “can” lead to repentance. On the flip side, if you have too many regrets, and are not changed by it or if it doesn’t cause you to run to God, then that’s not healthy for the soul either. Thank you for your loving comment, Matt and sgd too. Well I do pray that many will actually be drawn to repentance now as events speed up and unfold because Jesus does love us. But I have met many on FB for a long time that even after 3 yrs or 5 yrs were still the same with no evidence of any change in their life yet they would say they were saved. How can you be saved when you are still lost? If someone truly has the Holy Spirit in them, they just can’t remain the same and there will be a lot of changes for the better as well as healings of the deepest wounds of the heart etc. Amen, Brother Steven. Bless you Matt. Bless all of us on our faces trying to live Galatians 2:20 daily. HOURLY. Thank you, Holy Spirit, for bringing this blessed wave of personal repentance. Wow, people. It’s really coming, isn’t it? No…it’s already here. Matt, how difficult it must have been to write these words! So many of us have prayed for the Lord to warn us and especially as the time for these judgements near. The time IS near, may every Christian be in prayer and intercession for this land, for the souls being lost and for wisdom to know what we are to say for those shocked and tormented people who survive, waking up out of their stupor! May the true church arise to its task, and may tens of thousands be saved following this cities destruction! We were born for such a time as this! Shalom all z3ers! I’m beside myself happy the God has called me as one of the last fruit of the harvest as you described. I used to be very devoted to God a decade ago and the fell away. Really I was more just a lukewarm Catholic. About a month ago I forced myself to start praying the Rosary, very begrudgingly. But it worked and I’d say around the 18th God called me, blessed me to where I felt his intense love for me and his desire for me to be on His side. I found z3 quite by accident last week when it got very busy and then quiet. I am changed again! I wake up with Glory for God and try to pray all day in my mind with whatever I’m doing. I could never be this devoted on my own and seriously never have been. So for those of you who have been atz3 for a while, please know the prayers are working. A specific dream I’ve had on my mind all day. I’m in a house with a group of people. We look out the window to the city and see smoke piles everywhere. We had to get out . Next scene I’m passing by masked men who were responsible for the destruction. We go looking for water in the store. Mass chaos. This is confirmation .. fire, destruction and desperation will soon ensue. Wow, Ginger. That’s intense, but unfortunately what’s most likely coming. yeah something is up…. I warned my friends in Tokyo and glory to God, they believed!!!! However, my sister in law is planning to go to Tokyo this December even though I posted multiple warnings on social network (and she saw them). I will continue to pray for Japan. Thanks for the information Christian. Christian, I have information on November 15th also. The Georgia Guidestones had a cube (shaped like a dice) inserted into the top of the English side in 2014, with the exposed portions saying 20 on one side, 14 on the other. It was “supposedly” unauthorized, and was put up by “vandals,” to signify a couples wedding date or some other BS story. It was very ceremoniously removed on 9/25/2014 (Rosh Hashanah), and thrown down, before being “chipped” into pieces, with care to save the information on each of the six sides, so each chip could again be shown to the videographer. However, before being chipped into pieces, the videographer revealed the information the other four sides contained, in a very specific order; 8-14-20-16, which just happened to be the 9th of Av on 8/14/2016. I knew this “clue” was way too obvious given the history of that date, but made note of it, and filed it away. About a month or two later after watching the video in 2014, I wondered if they could have been using the Hebrew calendar, so I filed both the Gregorian and Hebrew dates away. Once 8/14/2016 passed uneventfully, I turned my attention to the Hebrew calendar, and you guessed it; 11/15/2016, is Cheshvan 14 (8/14). This entire event was VERY carefully scripted, and posted to YouTube two years ago, if you want to conduct research of your own. May be another false alarm, but thought I’d share. Hmm, interesting. Yeah I had written off that cube, but you are saying eighth month of orthodox calendar and 14th orthodox day on the gregorian year 2016? Actually, Cheshvan 14, (8/14) on the Hebrew calendar, starts on Monday November 14th, 2016 and ends on Tuesday November 15th at sundown. So, rather than 8/14/2016 on the Gregorian calendar; possibly it was a warning using the Hebrew calendar? Assuming most would have forgotten about it after August past. Yesterday we had a 6.2 quake off the shore of Japan, which may have been a forewarning? Two larger quakes in Japan and one smaller quake near Fuji. CB – Nov 14 is way more in my view than just a supermoon. The moon has never been this close to the earth since the 30’s or 40’s as it will be on Nov 14 and it wont be this close again for many more decades from now. So in terms of lunar watch, its the biggest in our lifetimes. Truly a once in a lifetime event. A little more research lined up which makes me think that this is the week for the Japanese earthquake. The first of Cheshvan begins on Tuesday the 2nd in Jerusalem. I believe that Japan’s day follows the start of the day in Jerusalem, so the first of Cheshvan in Japan lines up with November 3rd and Culture Day. The anniversary of the plague of Dever would then be the same day as the 70th anniversary of the signing of the Japanese constitution. Neville Johnson mentioned that the quake would shut down their stock market, but that it would be propped up for a time. Others had dreams of half of the Japanese “house” or market collapsing. People would run back in and then the other half collapses. It all lines up with the 5th and 7th plagues. In the 5th plague, only the livestock in the fields died. In the 7th plague, more livestock as well as people died in the fields from the hail and fire. For this reason, I think that the earthquake will have a major impact on their market (down 50%? ), but there will not be a tremendous loss of human life. At the anniversary of the 7th plague (Mt. Fuji eruption), however, the Japanese stock market will be more completely destroyed, but there will be a terrible humanitarian crisis as well. Just as in Egyptian times, many people (7-8 million according to John Paul Jackson) will lose their lives to the hail and fire. Pray for Japan. I have a friend in Tokyo right now. He is Jewish by descent but a born again nominal believer. I have warned him about Fuji, and he thought it was one of my jokes. I dont judge him but am concerned about all this quake talk in Japan. One thing Im not connecting is….why all this Jewish date and plague talk? How does that relate to Japan? Is it because their nation when founded made no provision for the one true God or something? Someone inform me or bring me up to speed on this. When was the anniversary of the Great Tokyo Quake of the early 19th century? Shalom. Hi Cristian I had a short dream in july. Saw a computer screen with an article written by a scientist titled “japan is going to have a big earthquake this fall”. Now I do not know when the “fall” officially starts and ends but i have been watching closely!!!!! Blessings! Thanks Chloe! I believe Phanuel had a dream about the Japan and a computer screen as well. I don’t know if his dream specifically mentioned an earthquake or not. We should all be praying for our nation as well as Japan, but if a large earthquake does hit Japan on November 2nd or 3rd, we need to increase our prayer for Japan significantly as that would be an indicator that Mt. Fuji would erupt roughly 2 months later. Jackson’s prophecy indicated that as many as 8 million people could perish if that happens. Keep praying! Remember that even Ninevah repented at the last minute. I have never been to Japan or really thought much of Japan before having this dream. It was only after this I found JPJ’s warning about Mt Fuji/EQ. It is terrifying to think of the implications of that simple headline: Tokyo Is Gone. Frequently I pray for Japan and the Japanese people. Surely there are many righteous there? Thanks for sharing this mem! Blessings! Yes, definitely something to watch out for and pray for. JM also had several visions about Japan’s earthquake (if I recall correctly) back in June or July. I believe it was JM who saw the computer screen where the yen was surging high against dollar and then all of sudden it just disappeared. Blessings! I too share your concern for Japan, and wanted to share some information, that correlates with your research about a quake in the next few days. Because Japan is so far ahead of US time zones, exact timing is impossible, so this information is US based. November 2, 2016 is 55 years, 5 weeks, 55 days from 8/4/1961 Barack Obama’s DOB. November 4, 2016 is 55 months, 55 weeks, 5 days from the 3/11/2011 Fukushima Quake/Tsunami and Nuclear disaster. It’s also exactly 96 months since Obama’s election night on 11/4/2008; and of course he was there earlier this year for the G7 meeting. I know of nobody that I can warn in Japan, but your research aligns perfectly with mine. I pray this information might find it’s way to help to turn lives to Jesus! Wow! Thank you for that DFM. All of those 5’s aligning with the anniversary of the 5th plague is pretty amazing. I have only focused on day counts occasionally when looking at the Hebrew calendar, but it seems important. It’s great to have others with different abilities and giftings weigh in on these things. I think it helps to give us a more clear picture. Keep up the great research!